2010 amendments to Regulation E required banks to obtain explicit consent from customers to opt in to overdraft programs covering ATM withdrawals and point-of-sale (POS) debit card transactions. Current regulations do not require opt-in for either regularly scheduled online bill payments or check overdrafts. The current model form A-9 is found in the appendices to Regulation E.
Overdrafts occur when a customer lacks funds in his or her account to cover a transaction, but the financial institution pays the amount anyway. 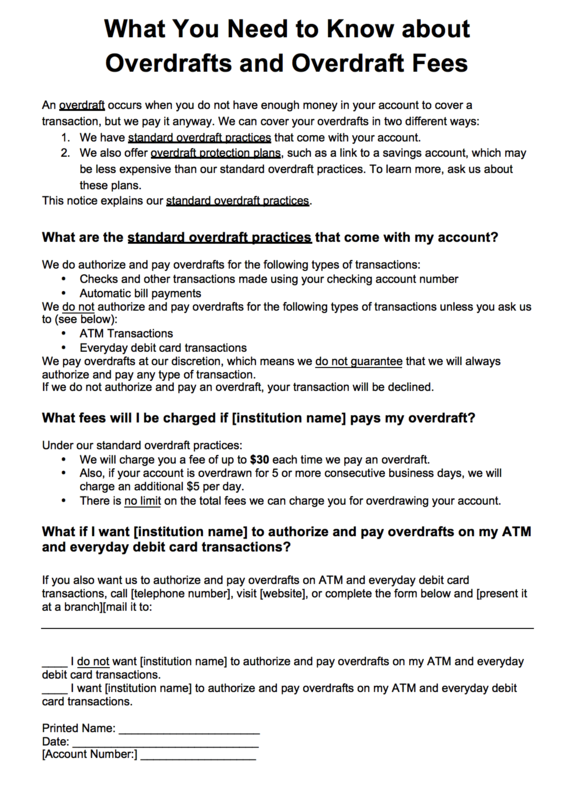 Financial institutions typically charge customers a fee for each overdraft transaction, up to a maximum of six overdraft fees per day. Customers who do not participate in an overdraft program will have POS or ATM transactions that would result in an overdraft declined. Many financial institutions offer programs linking checking accounts to savings accounts, credit cards, or lines of credit. These linked accounts automatically transfer funds when an overdraft would otherwise occur. The total costs and fees associated with linked accounts are usually lower than the fees associated with overdraft protection plans, especially for customers who frequently overdraft their accounts. The new prototype forms, with their more graphic-oriented or tabular format, seem clearer and likely more effective than the current model form at conveying cost and risk information. In this respect, financial institutions may welcome the introduction of one or more final approved forms, especially since the CFPB plans to make any forms it adopts available for free downloading on its website. The CFPB promises that the forms will be editable so that financial institutions will “be able to plug their specific program information into the online form.” The CFPB hopes that its “new approach could make it seamless for banks and credit unions to use a new model form within their existing compliance systems, and easier to update their disclosures following future overdraft program changes.” Although use of model forms is not mandatory, the CFPB emphasizes that the 2010 model form “continues to apply” while the prototypes are being tested and until one or more is formally adopted. While financial institutions may appreciate clearer, updated disclosure forms, especially if implementation costs are negligible, the “Data Point: Frequent Overdrafters” study used to justify the revamped disclosures can be questioned. For example, the study uses overdraft data from January 2010 through June 2012 — stale data given the rapid development of payment systems and changing consumer payment practices. Among other matters, the use of older data indicated that overdraft fees averaged $34 per transaction, but more recent data place that figure around $30. Even mainstream media have reported in recent years on the decrease in average overdraft fees. Additionally, the data sampled by the CFPB skews heavily toward “frequent overdrafters,” which comprise 20 percent of the accounts analyzed by the Data Point study, even though such customers comprise closer to 9 percent of the total banking population. By over-emphasizing this group of customers, the data may paint an overly dire picture of the effects of overdraft activity. Finally, although clearer forms may help consumers, the prototypes do not address some of the most pressing issues facing financial institutions, such as the ordering of transactions, the method used to calculate account balances or the manner in which bank employees present opt-in forms to customers. These issues have been the subject of recent lawsuits, and such litigation seems likely to continue even after the CFPB adopts one or more of the prototype forms. The CFPB’s materials do not include any clear indication of future rulemaking activity on overdraft fees and programs — a topic that is also of critical interest to financial institutions.